I have a confession to make. I stereotype notebooks, and it can make me overlook really good products that are out in the market. I tend to focus on Japanese-made products, because their aesthetic and quality appeals to me, with a smattering of products made in the US to round things out. 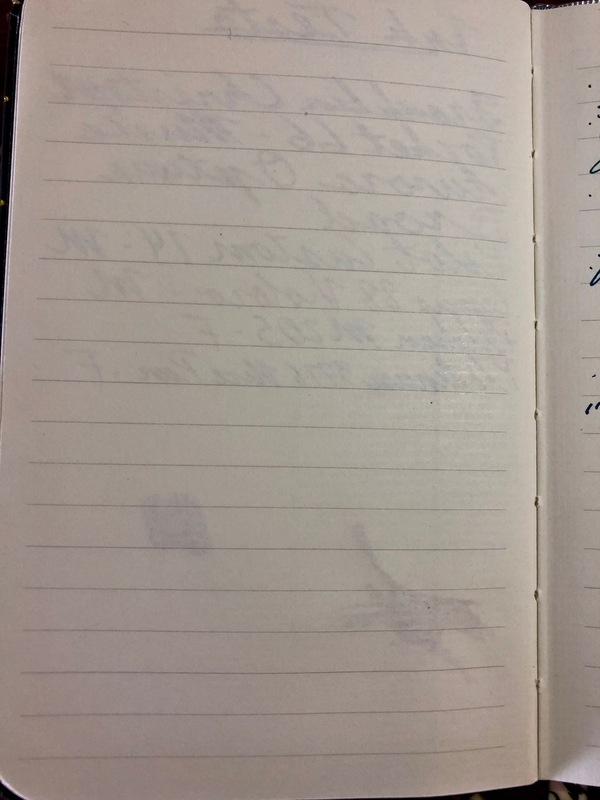 So, when Lisa Vanness from Vanness Pens handed me a Paperblanks notebook to review at the Baltimore Pen Show, I didn’t have high hopes. 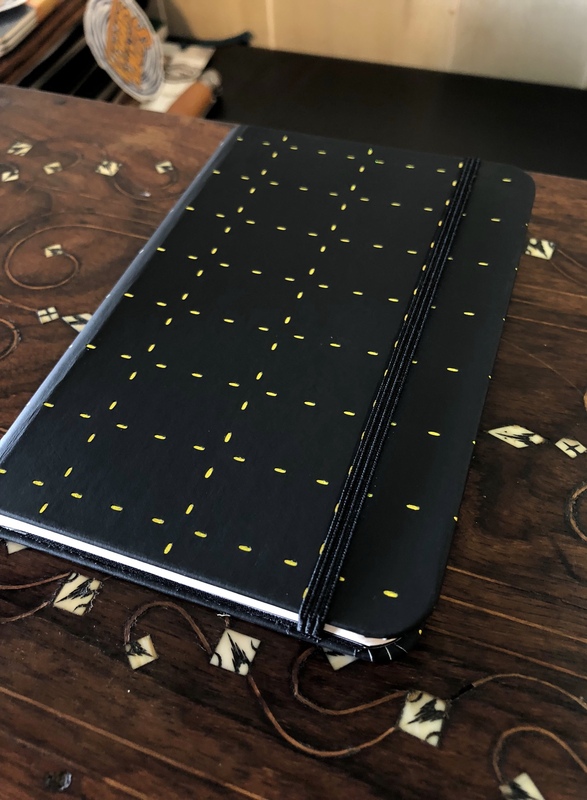 The Moleskine-style, hard covers and plethora of designs reminded me of the Stifflexible notebook that I tried and reviewed at first glance. But the A6-ish sized “Simply Holographic Mini” notebook caught my eye, so I took that one for review. And it blew my expectations right out of the water. While I tried my hardest to get a decent picture of this cover, I can promise you that I didn’t accurately capture just how nice the holographic effect is. It’s a “standard” green/yellow/orange holograph, but the pattern that they cut in the black cover keeps it from being overwhelming. Instead, it’s a little flash every time you open the cover without being a constant distraction. The binding is a standard Smyth sewn binding, but it looks a little more rounded than I’m used to with other notebooks of this style, which I rather liked. 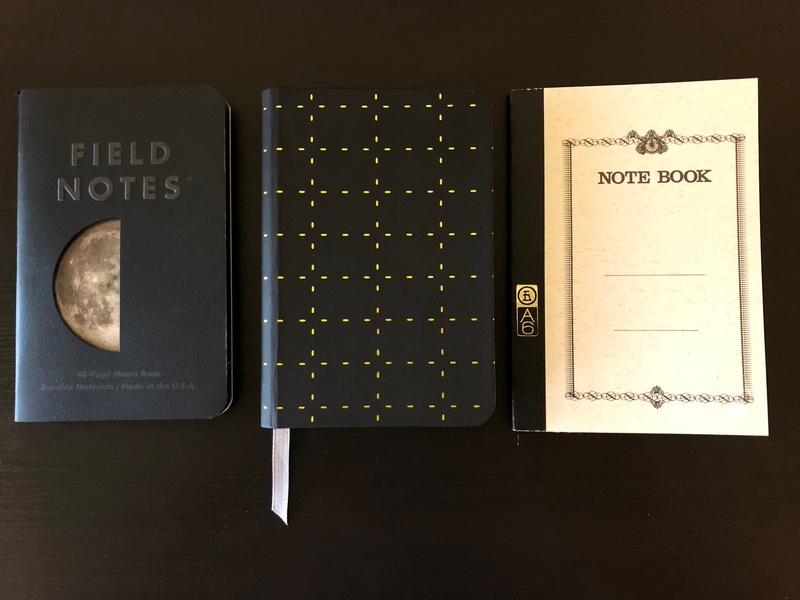 The “Mini” sized Paperblanks notebooks measure 3 3/4” by 5 1/2”, which is slightly smaller than A6 sized, but slightly larger than Field Notes sized. That in-between size helps keep the notebook from feeling too cramped in use. It could be a good pocket notebook, but the stiffness of the cover and the overall bulk makes it a little unwieldy to put in a pants pocket. Inside the notebook, there’s 176 pages of lined, ivory paper. According to a blog post from back in 2015, Paperblanks uses 85gsm paper in their Mini notebooks. For a nice overview of their philosophy on their paper, you can read that blog post here. It’s nice that they have everything published so clearly. Sometimes it takes a lot of digging to get a clear answer on the properties of a manufacturer’s paper. As I said at the start of this review, I didn’t have high expectations for the paper in these notebooks. 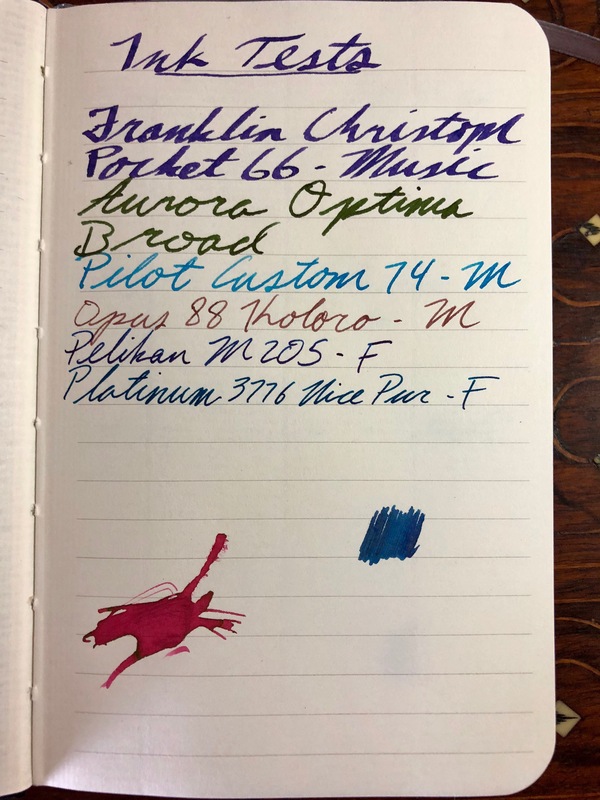 I expected that they’d be ok, maybe “fountain pen cordial” like the Nanuk notebook. So when I broke out my broadest nibs and didn’t see any feathering or bleedthrough, I was stunned! I quickly grabbed the other pens in my collection, and it took them all like a champ. Shading and sheen? Yep. Scribbles with a broad nib? No problem. Eventually, I dropped a blob of Krishna Myrtle on it just to see if I could get some form of abuse to bleed through. Nope. There was some buckling from the sheer wetness of the blob, but that was to be expected. Whoever is manufacturing Paperblanks’ paper is doing an absolutely killer job. It’s nice and smooth, but not coated and slick like say, Rhodia. When held up to the light, you can see laid lines in the paper that closely resemble Life’s L Writing Paper, but I believe that Life doesn’t sell that to anyone else, so I’m stumped. Nonetheless, this paper is awesome. At first, I was a little disappointed to see that the cover of the notebook would pop up slightly when closed after a bit of use. But, there’s what Paperblanks calls a “memento pocket” in the back of the notebook that also includes a strap to help hold the cover down. That was a nice, surprising touch that I think I prefer to the more common practice of putting the closing strap directly on the back cover. Even the mini notebook also includes a bookmark, which is helpful with the high number of pages. Price wise, I will say that this is on the higher side for its size. The specific notebook I’ve reviewed here is currently out of stock at Vanness, but comes in at $11.95 USD. For a notebook with these dimensions, that’s a bit steep. But with the quality of the paper and the high number of pages, it evens back out a bit. There’s also a tremendous number of designs to choose from, including those gorgeous “Embellished Manuscripts” notebooks. So if you’re looking for something that’s a little different than the usual suspects, and want a cover with some character, the Paperblanks notebooks are definitely worth taking a look at. Keep an eye on the Vanness Pens stock, as it’s always changing, and pick one of these up for yourself. This notebook was provided to me free of charge by Vanness Pens for the purposes of review.